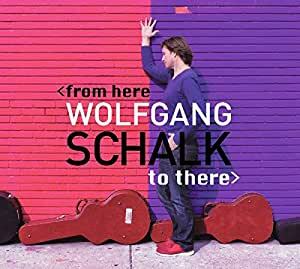 Guitarist and composer Wolfgang Schalk s new album From Here to There is an electrifying statement celebrating the "power of now" in jazz. Schalk's new compositions plus a fresh take on Ellington's "Satin Doll" bring the listener on a swinging spiritual journey from the first note. His band, featuring Andy Langham (piano), Carlitos Del Puerto (bass), and Clarence Penn (drums), masterfully support Schalk's characteristic warm sound and swinging lines. Schalks intimacy of style, so evident in the title song, affirm his status as one of the most talented guitarists of his generation. Wolfgang Schalk's seventh album as a leader, From Here to There stands as one of his finest works. The only reason I gave this 4 stars is I haven't listened to the whole CD. I'm half way through and very impressed. I saw this jazz album listing online at Down Beat magazine, and it was the flashing GIF file that caught my interest and after listening to previews on amazon, it was a buy. I'm in marketing and the flashing GIF was a good idea. Another strong release from a great virtuoso who so deserves a much wider audience than a few guitar fanatics and Bay area followers. The compositions are lovely and Schalk is a mainstream guitarist of unsurpassed fluidity and imagination, whether he's playing electric or acoustic. Perhaps the relative traditionalism of his sound - he never turns up the distortion or plays around with effects - is part of the reason he's not better-known, but all it takes is a close listen to one tune to realize this guy is every bit the equal of the two Pats (Martino and Metheny) or anyone else you choose to name. His nylon-string acoustic playing is in a league of its own, and as with his previous materpiece "Wanted" his carefully-chosen bandmates are superb across the board. Schalt may not be a trail-blazing innovator but he is one world-class musician.